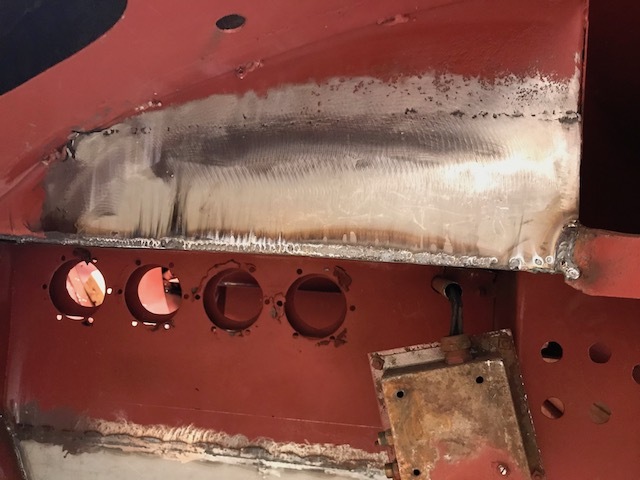 The last post that detailed progress on the tanker fabrication work and repairs was Update #8. 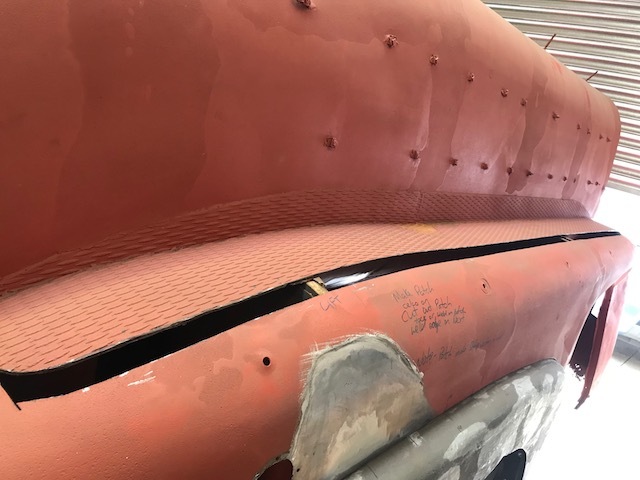 At that stage, the damaged lower rear area of the tanker had been pushed out, the trunk lid hinge reattached and new step casings fabricated. 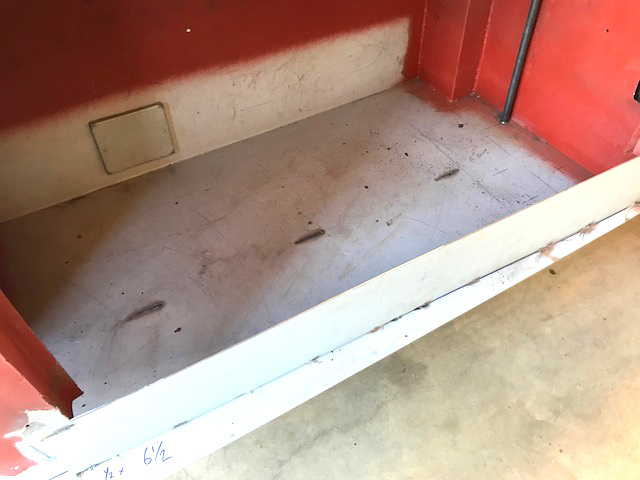 Work had begun on repairing the locker compartments and three of the four compartment floors had been replaced. Since then, Craig has repaired and replaced a number of other damaged areas in the Heil tanker. The floors in the two forward compartments are supported by a reinforcement beam running front to rear under the floor. 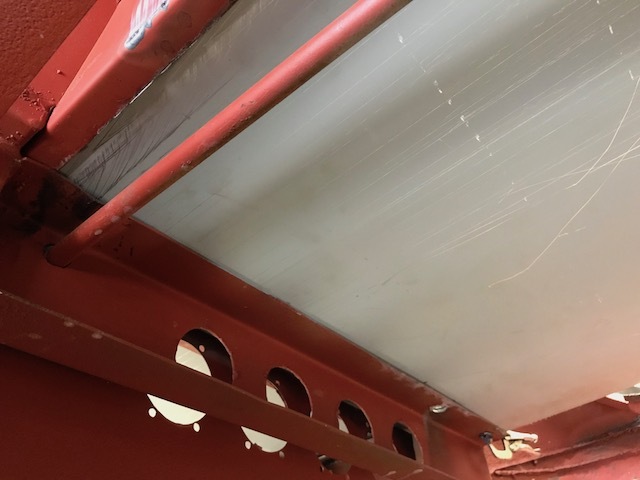 There are holes drilled through the floor and beam at each end of the locker and vertical support rods are mounted and bolted underneath the floor. 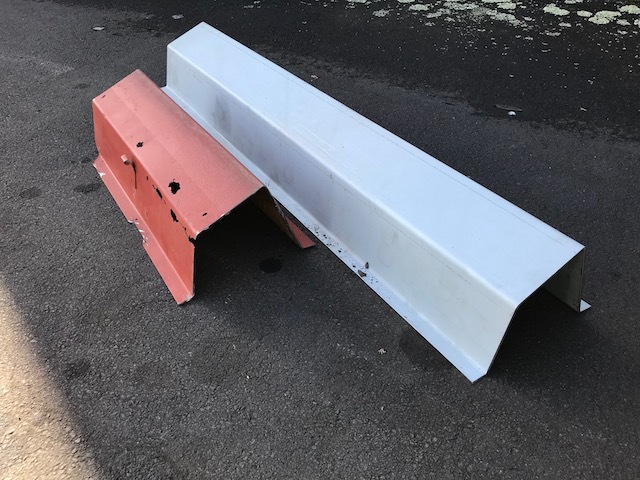 The original reinforcement beams were badly rusted so Steve had replacements folded up out of 1/8″ (3mm) EG steel at Manukau Sheetmetals. The rod can be seen in place at the right hand end of the locker. 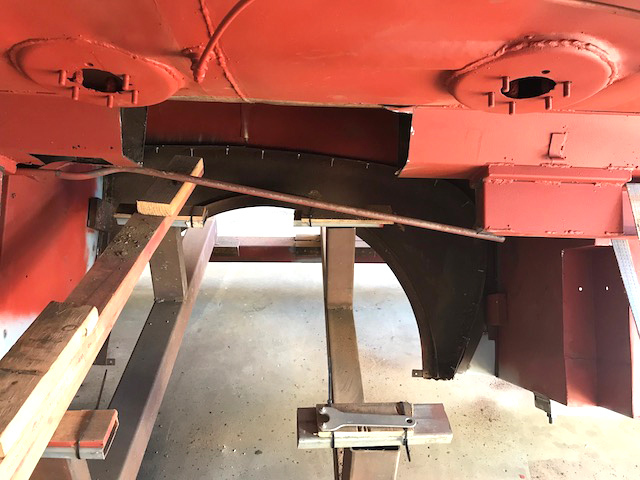 In addition to the rods bolted at each end, the beam was originally welded under the floor as well. 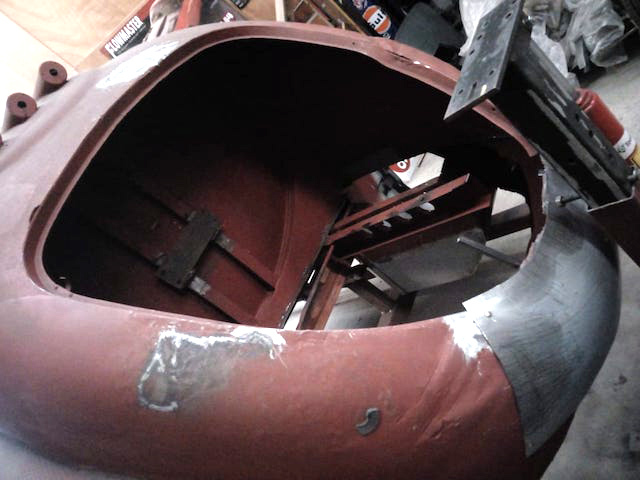 Craig has followed this process to replicate the way the original construction was carried out on the Heil tanker. Steelmasters Auckland Ltd in Penrose threaded the replacement imperial rods as per the original specifications. 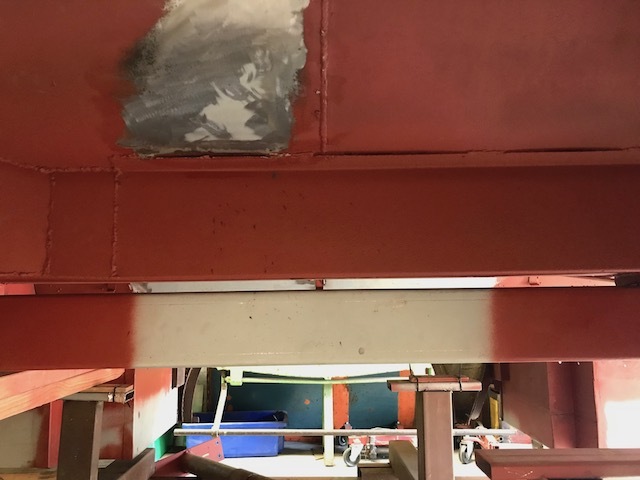 A view under the locker compartment with the reinforcement beam in place. The threaded support rod is visible above and below the floor line. The remaining area of the trunk floor was cut out and removed. 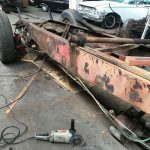 Craig discovered that the top edges of the trunk floor chassis rails needed to be repaired. Once these repairs were done, he moved on to the trunk walls. 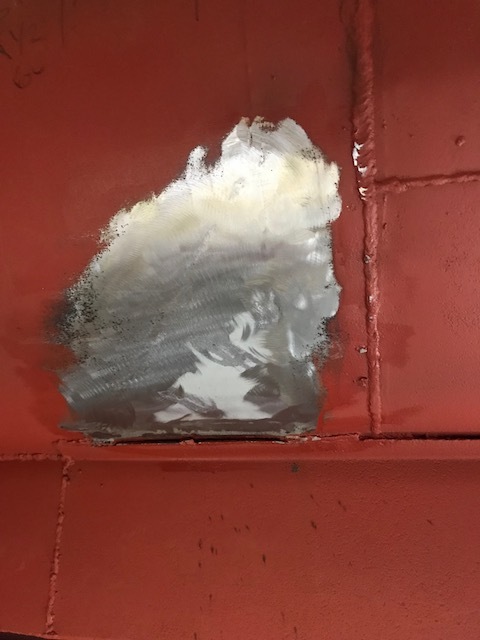 There was substantial rust in the right hand side of the trunk wall in the front corner so Craig cut this area out to repair it. The four holes that the pipework goes through can be seen just below the section that has been removed. 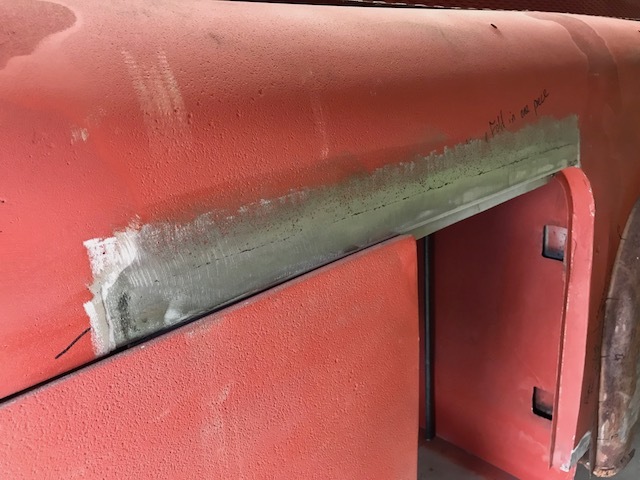 As well as replacing the panel shown above, Craig had to also cut out an area in the right rear corner of the trunk wall due to excessive rust. 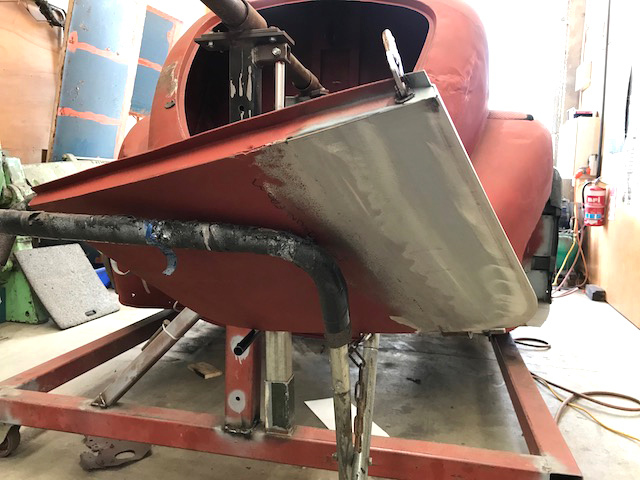 A template has been made of the trunk floor and work has begun on fitting the new panel. Under the tanker are two U channel body rails that run the length of the tank on each side. These rails are attached to the truck chassis by large U bolts. Around the same area on both body rails was extensive rust which Craig cut out and replaced. Wooden spacer blocks had been placed where the U bolts attached to the chassis. The blocks strengthened the area of the U channel under the bolts but unfortunately over time had caused the rails to rust. Manukau Sheetmetals folded up the lengths of U channel that were needed to replace the damaged sections. The image above is the opposite side of the Heil tanker where the body rail has been repaired / replaced. To provide the driver with a non-slip surface when walking on the tanker guard above the compartments, an area of checker plate (diamond plate) was placed along each side. A foot rail ran along the outer edge as a safety measure in case the driver lost his footing. The steel under the checker plate had rusted away badly so Craig has cut well past the checker plate in readiness for replacing the steel. The tanker guard and checker plate were originally attached to the tank and supported using L brackets. 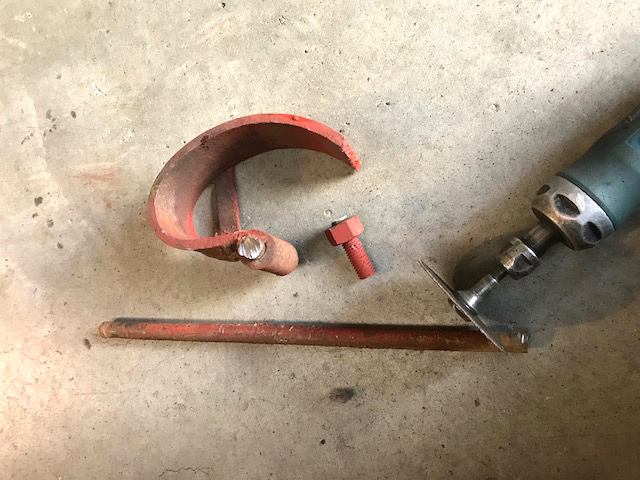 The brackets have been removed due to rust and new ones folded up. These will be welded back in once the tank guard repairs have been completed. 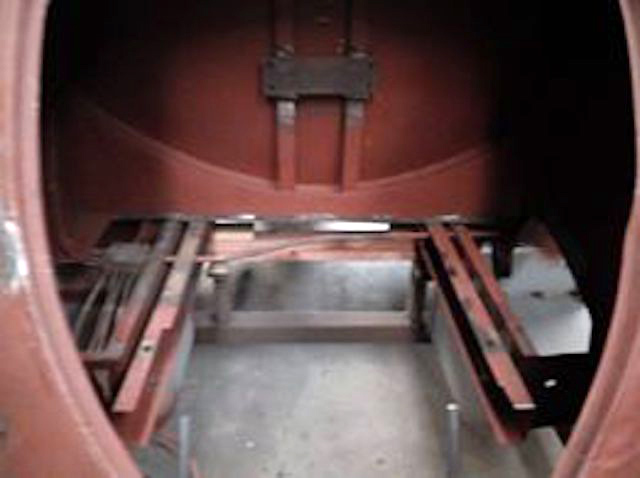 The hole at the bottom of the image is where one of the uprights is mounted that supports the foot rail. Most of the locker hinges had been gas cut off in the States prior to shipping and the doors removed. The parts of the hinges attached to the tank still held the pins and were seized up. Steve had to cut out the pins in pieces to remove the hinges. 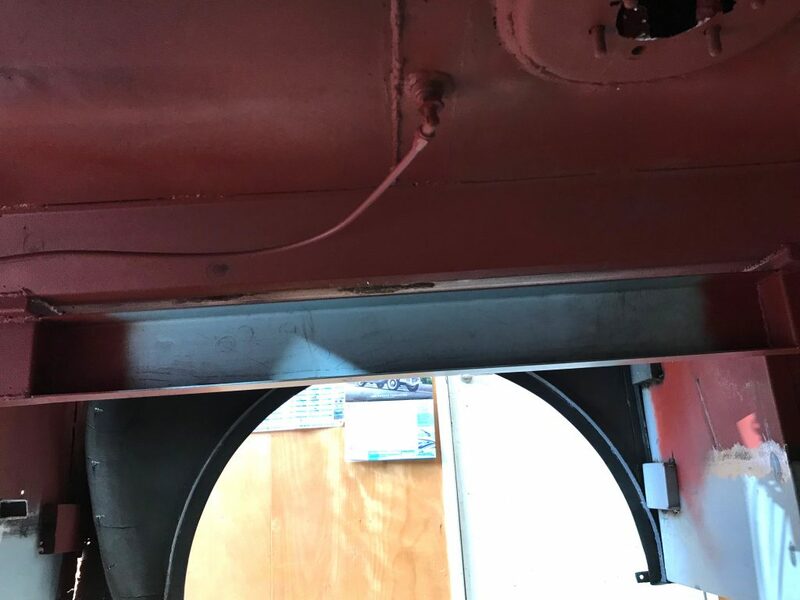 Interestingly, the locker door hinges, with the full length, one piece pin in place and the door fitted, were welded to the Heil tanker during construction. 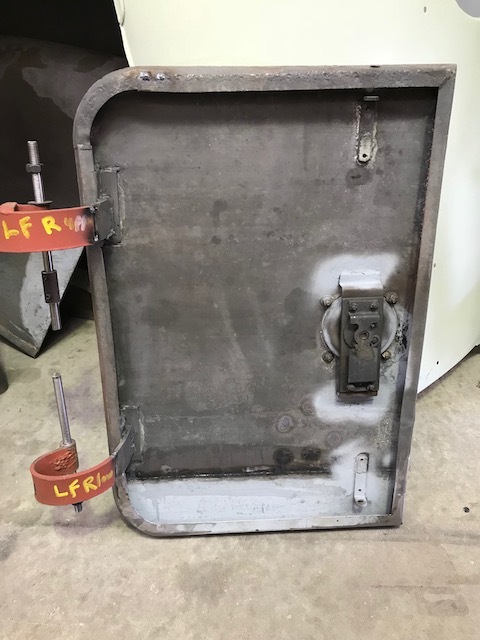 This meant the locker doors were never able to be removed once the tank build was complete. Steve has now made a two piece replacement hinge pin which will allow the refitting of the doors and future removal for painting, etc. This is the first variation to the original construction method that we have had to make. The outer frames on all four locker doors have rusted and been damaged over the years and have all needed repairs. The new two piece pin has been fitted to the hinges in this image. The location of the horizontal bracing tubes on the inside of the door. 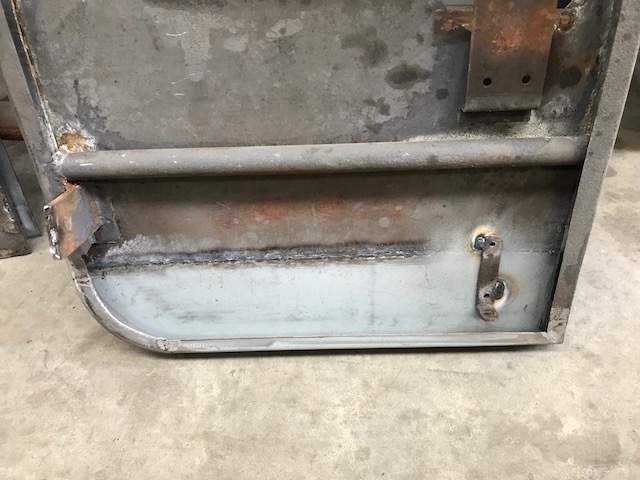 Typical of older vehicle doors, the main rust area is at the bottom where water has been trapped. Craig has made up lower skins for most of the locker doors. 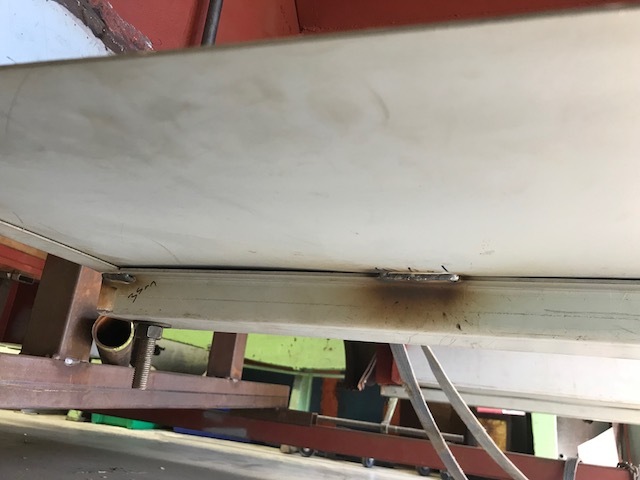 Some of the horizontal bracing tube has rusted badly inside the locker doors so these have been removed and replacements are going to be welded back in. 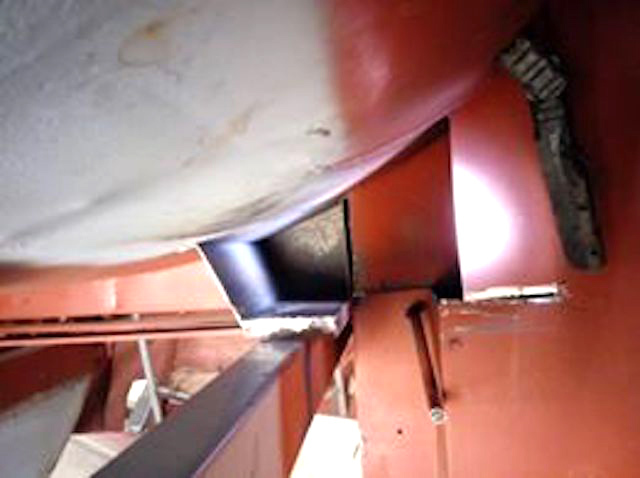 The petroleum delivery hose is stored in a steel channel that sits above the body rails. 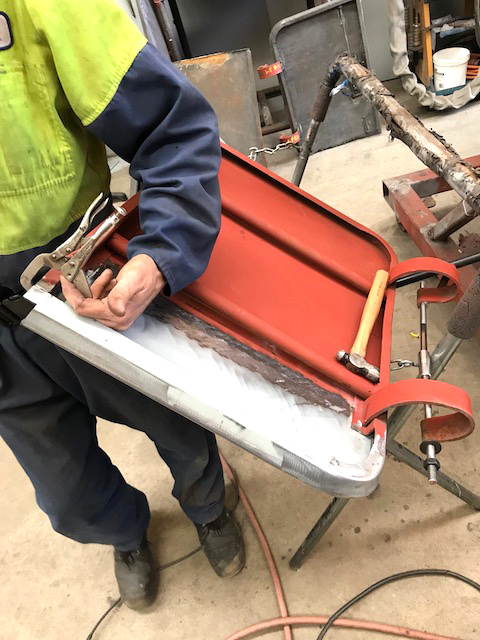 One area of the channel was rusted and damaged so Steve got Manukau Sheetmetals to once again fold up a replacement piece. The section of channel is shown above that was cut out due to rust and damage. 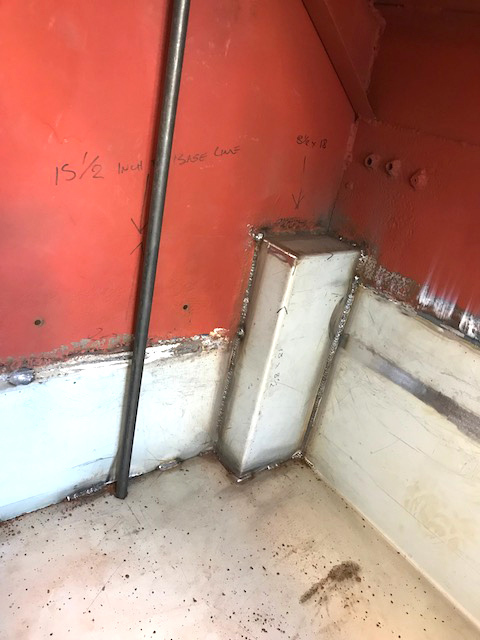 Craig has since welded the new length of channel back in. 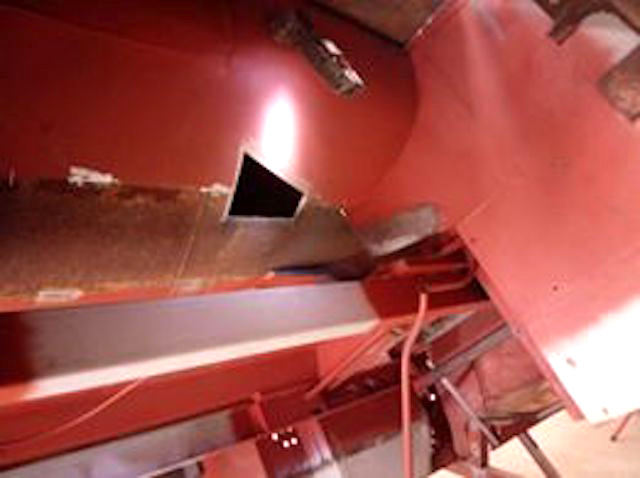 Looking under the fuel tank towards the rear of the truck, the shape of the hose channel can be seen where a section has been cut out. 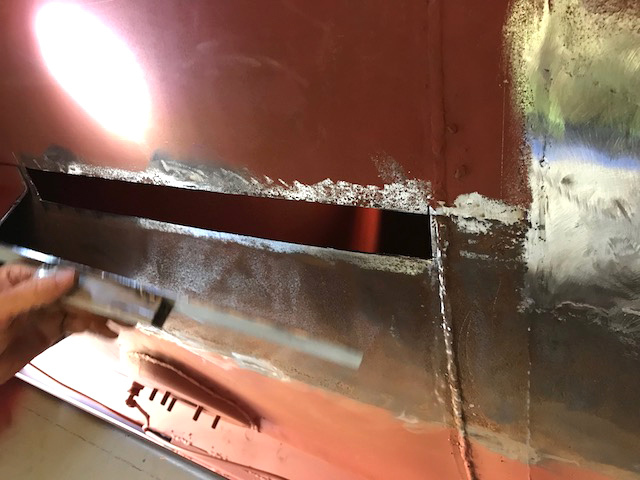 Craig identified any areas in the fuel tanks that had rusted through. He has cut out the affected areas and welded patches of the heavy gauge steel back in. Craig has also cut out and replaced a couple of rusted areas on the tanker body itself. 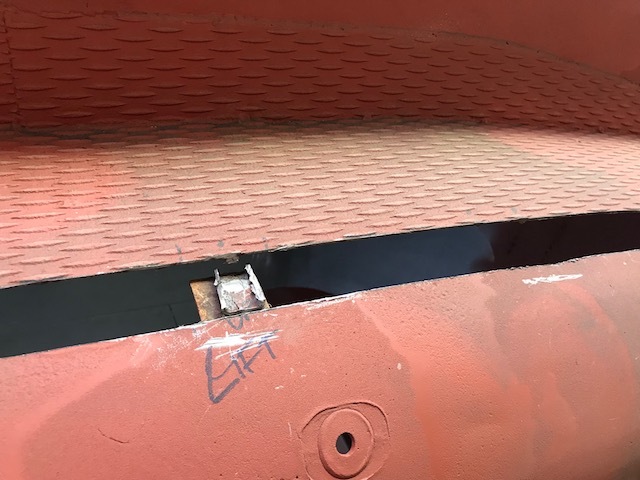 A large patch was cut out and replaced above one of the tank fenders. 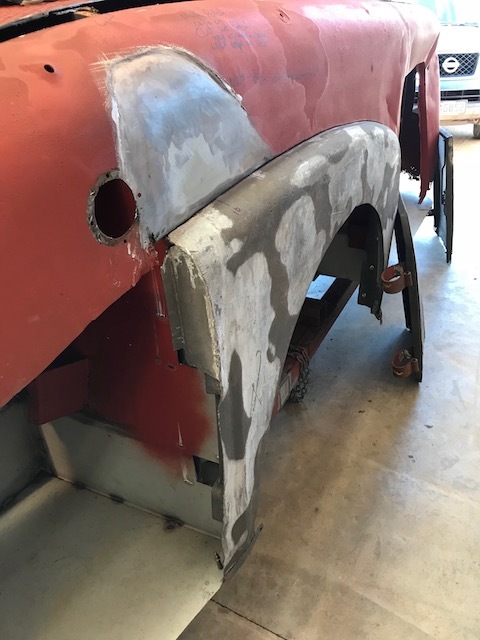 Work hasn’t begun yet on the fenders so the patches that are visible are the areas of lead that were originally applied during construction. 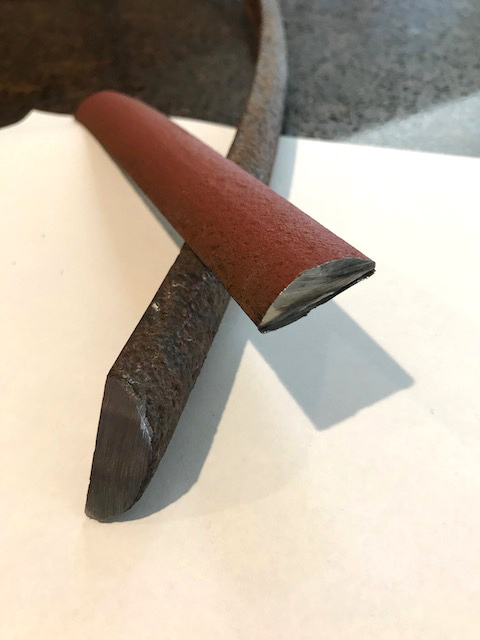 Steve had to source two different profiles of 1/2 round steel bars for separate areas of the tanker. 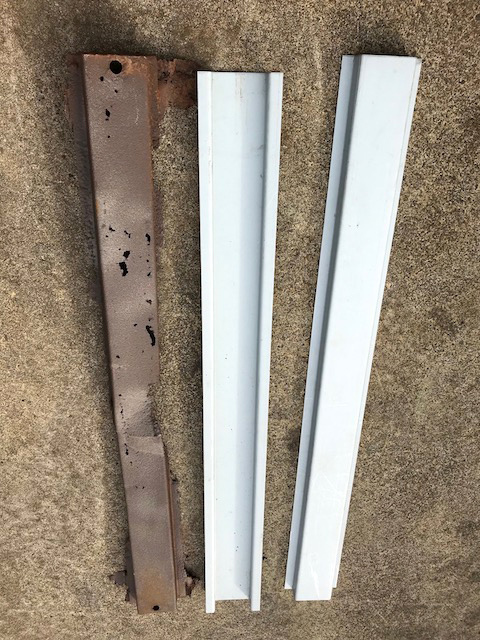 Both of the original bars have rusted in areas or been damaged beyond repair so lengths of these are needed for sections to be replaced. 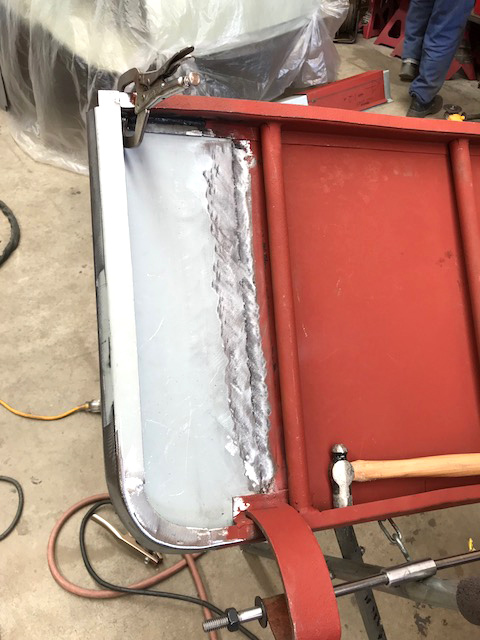 The first is a 1″ x 1/4″ half round moulding that is welded around the entire bottom edge of the tanker. 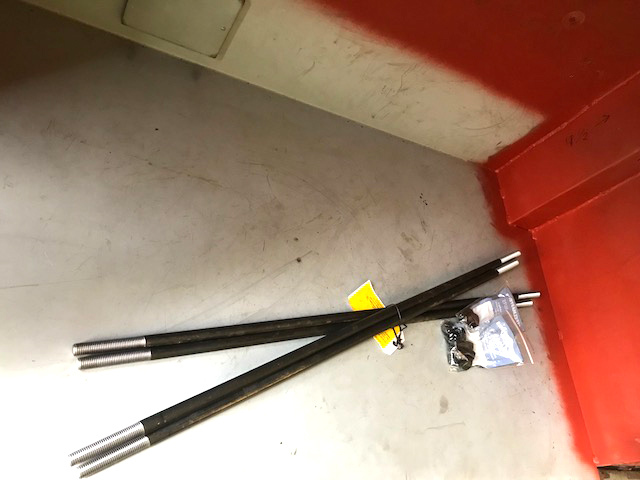 The second is a 1″ x 1/2″ half round bar that is needed for the rear bumper. Steve contacted Starry Malcolm in Northern California to help search for the correct profile steel bars. Starry found a local supplier and was able to purchase the steel bars in each size. The bars are sold in standard 20 foot lengths so they posed a bit of a challenge for us to get them down to New Zealand. Starry had them cut in half but they were still too long to send by post / courier. 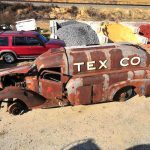 Duane Jones from the California Roadster Company kindly collected them and delivered them down to LA. Steve Curle and his team at Kiwi Shipping are now helping us get the bars shipped to Auckland. A real team effort by everyone involved which we really appreciate. So a huge thank you to Starry, Duane and Steve for their combined efforts in getting these bars back to New Zealand. The Heil tanker is obviously not the only vehicle being repaired at Creative Metal Works. 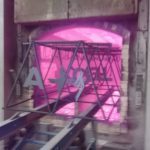 Simon and Craig have some other very rare and exciting projects that they are currently working on and are busy to say the least. So we very much appreciate them working the Heil tanker into their schedule and the great job that is being done. 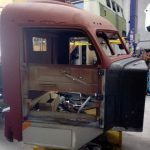 thanks for the update on the restoration it is great to have contacts who are able to help Over the years many people have asked me how do you get the parts to keep these old cars on the road I say when you own a car like this you know where to get the parts. Thanks for yet another wonderful update Sue. There seems no shortage of guys who are willing to help with the project and together with Steve are making great progress. Really love these informative project blogs. Keep up the good work. 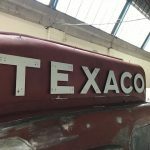 great workmanship from all involved in this amazing restoration.I enjoy viewing each project ” episode”. Enjoying your updates – looking good! Thanks.